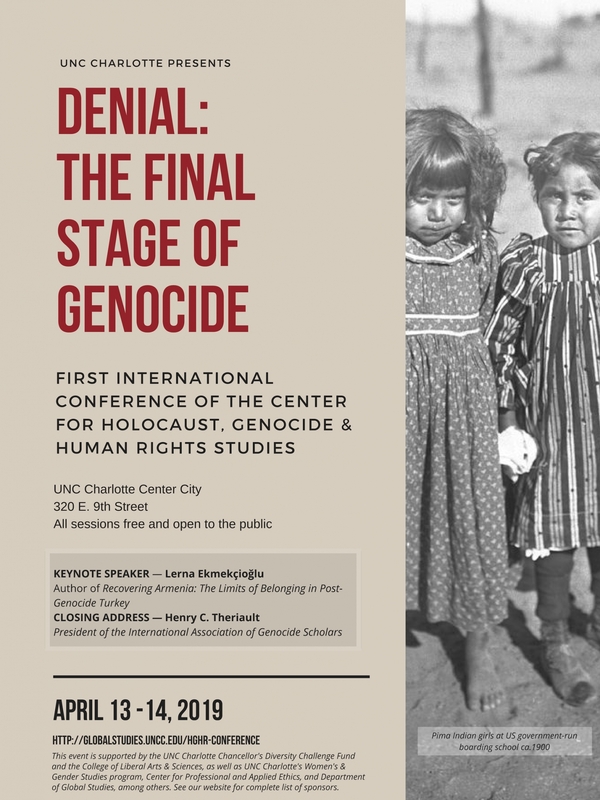 Over the weekend of April 13-14, our Center for Holocaust, Genocide & Human Rights Studies will host its first in a series of international conferences, “Denial: The Final Stage of Genocide.” The conference, held at UNC Charlotte’s Center City, brings together scholars, activists, educators, and students to discuss origins, significance, and potential responses to official and popular genocide denial throughout the world. Given the contemporary rhetoric of “fake news” and the increasing avenues for almost anyone to share or promote stories without factual underpinning, the need to confront genocide denial is more urgent than ever. The conference’s keynote speaker will be Lerna Ekmekçioğlu, hIstorian of the Modern Middle East at MIT and author of Recovering Armenia: The Limits of Belonging in Post-Genocide Turkey (Stanford University Press, 2016). Henry C. Theriault, Ph.D., President of the International Association of Genocide Scholars, will deliver a closing keynote address, "Is Denial Truly the Final Stage? Consolidation and the Metaphysical Dimensions of Denial." All sessions are free and open to the public. No registration or RSVP required. The conference is supported by the UNC Charlotte Chancellor's Diversity Challenge Fund, the College of Liberal Arts + Sciences, and the Department of Global Studies, as well as the Center for Professional and Applied Ethics and others.